Glen Durrant (pictured above) etched his name into the history books as the estate manager from Middlesbrough picked up the BDO World Darts Championship title at the historic Lakeside venue for the third year in succession. Durrant joins Eric Bristow in the history books as the latest player to win three World Championship titles in succession. Durrant of course joins an illustrious list of names to have won three World Championship titles such as: Eric Bristow, John Lowe, Raymond van Barneveld, Phil Taylor, Martin Adams, Michael van Gerwen, John Part, Trina Gulliver, Lisa Ashton and Anastasia Dobromyslova. In Sunday’s final, Durrant came up against a really tough competitor in Scott Waites who always comes alive when it comes to Lakeside. Durrant fired out of the blocks as the final got underway. An 83 finish on the bull, and following that, ‘Duzza’ produced a fantastic 11-dart leg to double his advantage in the opening set. Durrant continued the onslaught to wrap up the first set 3-1 with a 93 average. But, as you’d expect, Waites came battling back in set two as he levelled the match up at 1-1. Durrant did have his chances in the opening leg, but Waites thrived on the opportunity. Durrant did produce a roof-raising 131 checkout, but Waites held firm. 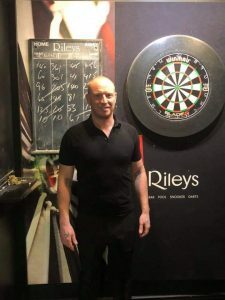 Both players continued to trade blows as the match went on, Durrant once again regained control of the match as he fired in two maximums and a 78 finish to wrap up set three. But, Waites just wasn’t going away as the Yorkshireman restored parity as he took the fourth set. In the fifth set, it was Waites who gathered all the momentum as he snatched the fifth set from Durrant’s grasp with a 15-darter to move ahead for the first time in the final. But as Glen Durrant does, the World no.1 came firing back to restore parity once more to level the match up yet again heading into the interval. At the break, Durrant maintained a 93.3 average to Waites’ 91 as the pair fired in eight maximums-a-piece. During a lengthy interval, it allowed both players time to relax and gather thier thoughts. It’s fair to say that the interval suited Durrant the better as he could take advice onboard, and psychologically, Durrant has been through the mill over the past few years at Lakeside. After the break, Durrant really did up his game, and despite a spectacular 160 checkout from Waites, Durrant went on to break the Waites throw to take the seventh set. The confidence from regaining the lead really showed in Durrant’s performance levels as he never once looked back. ‘Duzza’ created daylight between the two players for the first time in the match as the Teesside ace moved into a 5-3 lead which was aided by an 80 checkout to take his third set in succession. Waites did manage to carve open an opportunity to fight his way back into the final as he forced a fifth and deciding leg in the ninth set, but Durrant showed great tenacity and fighting spirit as he produced a 177 visit followed by a double four to open up a comfortable 6-3 set lead. Durrant wrapped up the title in set ten as he came through another deciding leg as he produced a 48 checkout as the Teesside star sunk to his knees in delight, Durrant was always confident over the course of the week that he could win his third BDO World Championship title, and it was Scott Baker who came the closest to testing Durrant’s resolve as the Tipton-based player came from 3-0 behind to force a seventh and deciding leg, but Durrant showed his class in that one, and he hadn’t looked back since then with victories over Mckinstry and Williams. Durrant also went on to say: “My friends and family have travelled for five hours, and I thought that Scott had most of the audience tonight, but just when I needed to hear my friends and family, they were right there. I’m mega happy. 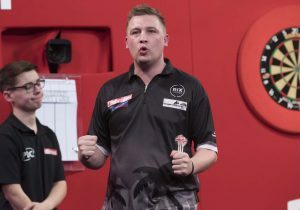 Bedlington’s Chris ‘Hollywood’ Dobey reached the last 8 of the PDC Players Championship Finals this weekend gone. The PDC ace was in fine form despatching Ron ‘The Bomb’ Meulenkamp in Round 1 by 6 legs to 3. Dobey kicked off the second round on the Main Stage vs Dave Chisnall in the afternoon session. He carried on his consistent scoring to defeat the St Helen’s man by the same scoreline as Round 1. 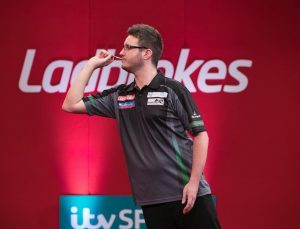 Moving onto the evening session and back on the Main Stage in front of a capacity crowd of 5,000, he was up against in form player, James Wade. The match was nip and tuck throughout with Dobey battling through to defeat ‘The Machine’ 10-9 to make it to the last 8 of the tournament. 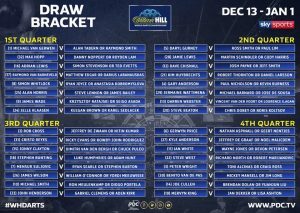 Chris entered the last day of the competition in high spirits but was swept aside by the eventual winner, Daryl Gurney by 10 legs to 2. A fantastic £12,500 added to his rankings and a superb run just in time for the World Championships. Fellow North-East players Adam Hunt & Ryan Joyce made their Players Championships debuts and both bowed out in Round 1, but with valuable money added to their Order of Merit. Glen ‘Duzza’ Durrant will look to make it a hat-trick of World Championship wins, 3 years off the bounce as he kicks off his BDO World Championship campaign on Tuesday 8th January 2019 at 7pm. Glen defeated Danny Noppert in 2017 and Mark McGeeney in 2018. Duzza faces the winner of either Mark McGrath of New Zealand or Englishman, Adam Smith- Neale. You can watch all the action live on Eurosport or Quest. 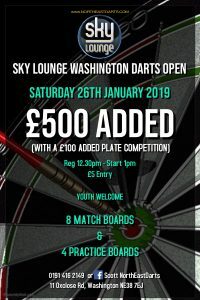 Results & Averages from this weekend. North East County Results & Averages from Gameweek 2.